“Murder on Bamboo Lane,” the first in a new mystery series by Edgar Award-winning author Naomi Hirahara, was awarded the 2014 T. Jefferson Parker Award for best mystery by the Southern California Independent Booksellers Association (www.scibabooks.org) at its annual banquet on Oct. 18 at the Beverly Garland Hotel in North Hollywood. 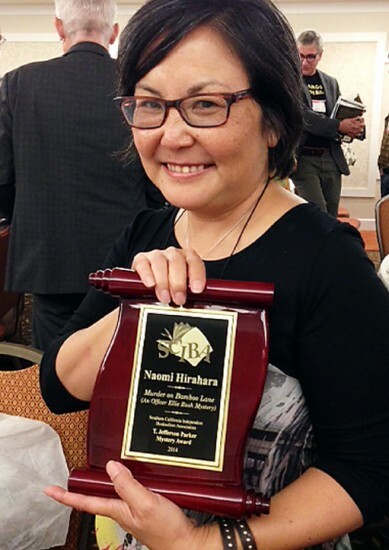 Naomi Hirahara was presented with the T. Jefferson Parker Award, named for a noted local mystery writer. The book, published by Penguin Berkley Prime Crime, follows the exploits of Officer Ellie Rush, a 23-year-old Hapa bicycle cop for the LAPD. Other finalists were Drew Chapman (“The Ascendent”) David Putnam (“The Disposables”). The retail price of the mass-market paperback and e-book is $7.99 each. Hirahara is best known for the Mas Arai mystery series, in which the sleuth is an elderly Kibei gardener. For more information about her future events, go to her website, www.naomihirahara.com. Fiction — Gabrielle Zevin for “The Storied Life of A.J. Fikry” (Algonquin). Other finalists: Laurel Corona (“The Mapmaker’s Daughter”), Michelle Huneven (“Off Course: A Novel”), Jervey Tervalon (“Monster’s Chef”). Nonfiction — Roy Choi for “L.A. Son: My Life, My City, My Food” (Anthony Bourdain/Ecco). Other finalists: Steven Hackel (“Junipero Serra”), Theresa Wahl (“The Auntie Em’s Cookbook: A Musician’s Guide to Brea”). Glenn Goldman Award for Art/Architecture/Photography — William Bradley for “Los Angeles Station: Tracks to the Future” (Angel City Press). Other finalists: Chris Burkard (“Distant Shores”), Miguel A. Gandert (“Hotel Mariachi: Urban Space and Cultural Heritage in L.A.”). Young Adult Novel — Catherine Linka for “A Girl Called Fearless” (St. Martin’s). Other finalists: Andrew Smith (“Grasshopper Jungle”), John Corey Whaley (“Noggin”). Middle Grade Novel — Holly Goldberg Sloan for “Counting by 7s” (Puffin). Other finalists: Stuart Gibbs (“Poached”), Tracy Holczer (“The Secret Hum of a Daisy”). Children’s Picture Book — Salina Yoon for “Found” (Bloomsbury). Other finalists: Marla Frazee (“God Got a Dog”), Keika Yamaguchi (“Puddle Pug”). SCIBA bookstore employees vote first to select three finalists in each category and second to select a recipient. Nominations are open to authors and illustrators of all publishers. Nominees had to have been published between July 1, 2013 and June 30, 2014, preferably reflecting the Southern California culture or experience. With the exception of the Goldman Award, the author and/or illustrator must reside within the SCIBA region (Morro Bay to the north, the Mexican border to the south, the Arizona/Nevada borders to the east).